Set includes one of each of the following designs: 5.75-oz. Diamant, 7.5-oz. Mille Nuits, 6.5-oz. Vega, 5.75-oz. Jupiter, 7-oz. Chateau Baccarat, and 7.75-oz. Harcourt Eve. 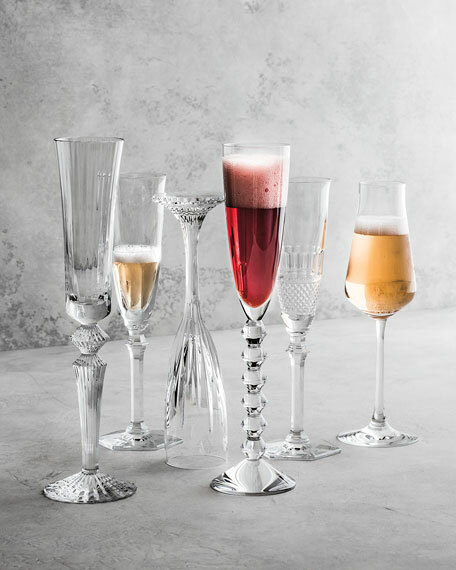 EXCLUSIVELY AT NEIMAN MARCUS Blush Oro Bello champagne flutes. Each, 2.44"Dia. x 9.25"T; holds 5.41 ounces. Beautifully hued blush and clear glass with hand-painted 24-karat gold detail. Handcrafted set of 4. Hand wash. Made in Italy. 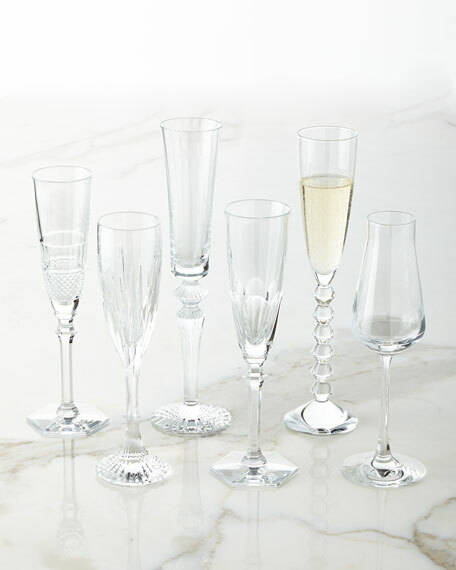 Set of 16 champagne flute glasses from the Touch of Dublin Collection. Non-leaded crystal. 16-piece set. 2.1"Dia. x 9.5"T. Each holds 7 oz. Hand wash. Made in Czech Republic. Handcrafted champagne flutes. Design collaboration between Lalique and James Suckling. Lead crystal. Sold as set of two; each measures approximately 2.25"Dia. x 9.375"T and holds 6.75 ounces. Hand wash. Made in France.